Cosmic Girls‘s Cheng Xiao recently competed at the 2017 Idol Star Athletics Championships alongside many other South Korean idol groups, but when she was awarded a bronze medal in rhythmic gymnastics, she couldn’t help but shed tears of disappointment. 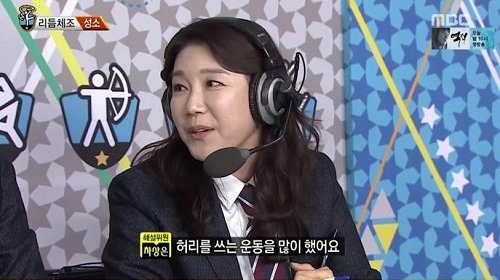 On January 30, MBC aired a special Lunar New Year special program, the 2017 Idol Star Athletics Championships. On this show, idols participated in a variety of different olympic sports, such as archery, gymnastics, aerobics, and track and field. In the rhythmic gymnastics arena, FIESTAR‘s Cao Lu, Lovelyz‘s Yein, TWICE‘s Mina, Cosmic Girls‘s Cheng Xiao, G-Friend‘s Yuju, and Oh My Girl‘s Yooa competed against each other for the gold medal. Of these girls, Cosmic Girls’s Cheng Xiao was already widely known as the dark horse of this field, from her previous gold medal in the 2016 Idol Star Athletics Championships, but to her disappointment, she ended up making a mistake in the first mastery move. Further in to her performance, Cheng Xiao’s hoop went out of bounds and resulted in another score deduction, thus ultimately landing her performance in third place. Despite her amazing results, Cheng Xiao could not help but shed a tear, as she had expected more out of her performance. According to judge Cha Sang Eun, who is an olympic coach for Korea’s rhythmic gymnasts, greatly praised Cheng Xiao and even commented that her performance was up to olympic standards. She explained that Cheng Xiao had strained herself incredibly hard to master these difficult moves, and that it was unfortunate that not everyone could see how amazing Cheng Xiao was in the rehearsals. Judge Cha Sang Eun praises Cheng Xiao’s efforts in mastering her rhythmic gymnastics performance. Cheng Xiao was rewarded with a bronze medal, while FIESTAR’s Cao Lu received silver, and TWICE’s Mina, gold.